If you tolerated my last contest, you might just like this one. To win prizes akin to the last contest, you must show me cards based off of cards or mechanics from other TCG's (gasp). This card is inspired by Hearthstone's mechanics of spell damage+ and the inspire mechanic (the trigger). This card is inspired by Shadowverse's Spellboost mechanic. 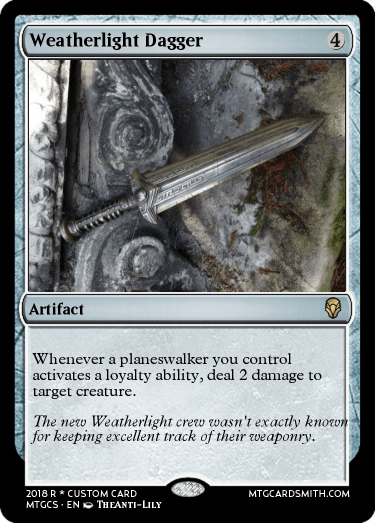 Finally, a card inspired by Order and Chaos Duel's (kind of terrible card) Everlight Dagger. 2nd Place: Favorites on 2 submissions, favorites on ANY 2 cards, and a contest that you would like me to attempt. 3rd Place: Favorite on submission, a favorite on ANY card, queue the song and dance. Unlimited submissions and have fun! The contest will be judged around the July 21st somethingth. 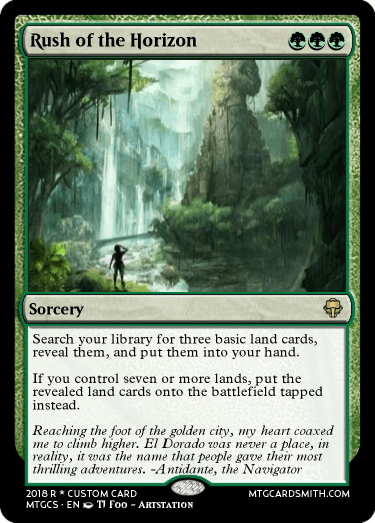 Inspired by Duel Masters, where there are no lands, and you pitch any card to the mana zone instead, where it adds one mana of its colour to your mana pool (my bad I forgot new wording). I like this! Definitely gonna try my hand at this! 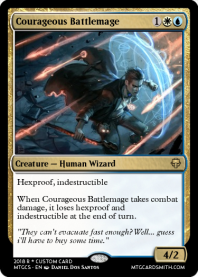 This card uses my old wording for the mechanic. In HeroScape you roll dice when attacking based on a units attack number and dice equal to its defense when defending. Dice are 6-sided with 3 attack symbols, 2 defense symbols, and 1 blank side. If, when defending, you roll shields in excess of the number of skulls rolled against you (if it is a normal attack from an adjacent figure), you deal damage to the attacker equal to the difference. HeroScape is awesome, but nearly unattainable in its original glory anymore. If you want to hear how amazing it is, look up the DiceTowers YouTube videos on it. Anyway, I've created an entire Counter Strike Set if you're interested. I've still got my heroscape set lurking in my closet, complete with the izumi samurai! Here's a card I did with the "Blaze" mechanic from "Cardfight! 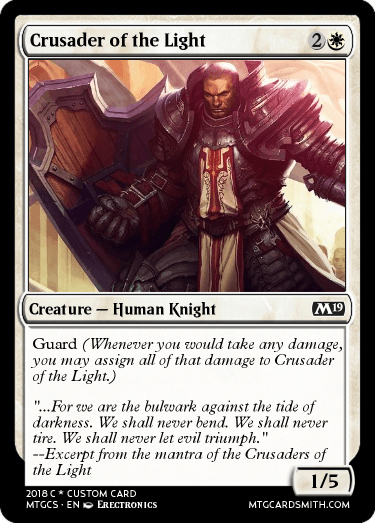 !Vanguard"
Vanguard was the first card game that I ever played and I'm glad that I could get the chance to represent it here! It's currently getting a GIANT shift in the rules, with the power level of cards being reset, but it really is something to get into! Also, maybe you should extend this contest's date for judging! The premise of this contest is great and I'd hate to see it go down just because it has so few entries! Maybe try "bumping" the discussion so that more people can see the contest in their feed more often! Maybe even put in example cards as bumps! 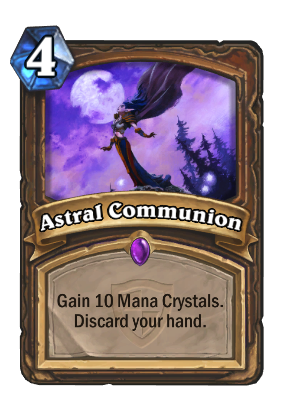 I didn't want to put a mana cost to "evolving" because pokemon didn't need energy to evolve, so I put the upkeep cost on the final evolution just in case someone nut draws all three in their opening hand and then gets a 4/4 flying, vigilance, trample for two mana. It also didn't make sense to make it only a sorcery because (in the show) pokemon could evolve mid-battle and seemed like a good way to out-value/tempo your opponent. It was hard to think about how to balance it because on one hand, you can nut draw, but on the other, you could never draw the previous evolutions making it a dead card. 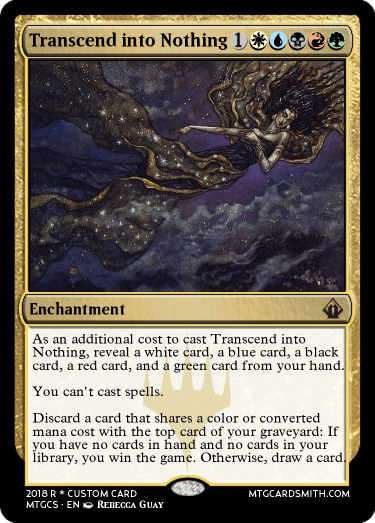 The upkeep also makes it hard to put into a reanimation deck. The other mechanic of pokemon is using energy to use their attacks, which I put as activated abilities. 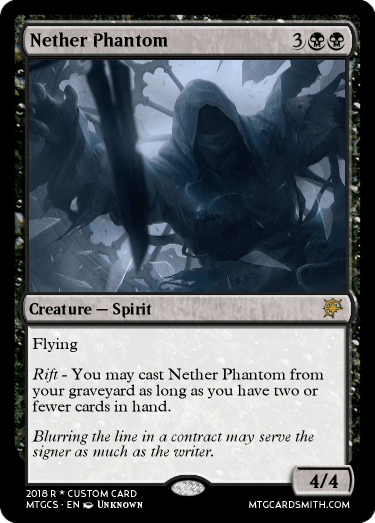 You may sacrifice a card named ~ rather than pay this spell's mana cost. That's correct according to current WotC standards: Examples. I guess you can ignore the above; as it turns out, that is just another way you could do it. 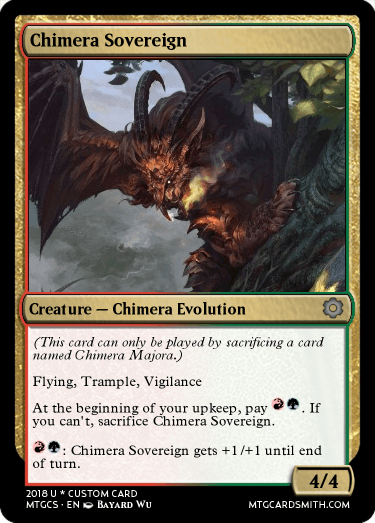 You could drop the sacrifice abilities of the smaller versions and add the alternate cast cost to the "Evolutions." I think I slightly prefer that approach to what you have currently as it avoid the need for clarification, but either are fine. Your reminder text is just so people know it isn't possible to cast "Evolutions" without sacrificing the predecessor; I think you should just reword it as it isn't accurate to what you are actually doing. It would actually be fine to drop to altogether in this instance. Your designs aren't technically new mechanics or abilities, just a new creature type. My take on this was more complex, worse in some ways. Here's the applicable Set and Discussion. @Faiths_Guide The reason I did it this way is because I didn't want the evolutions to be "casted". 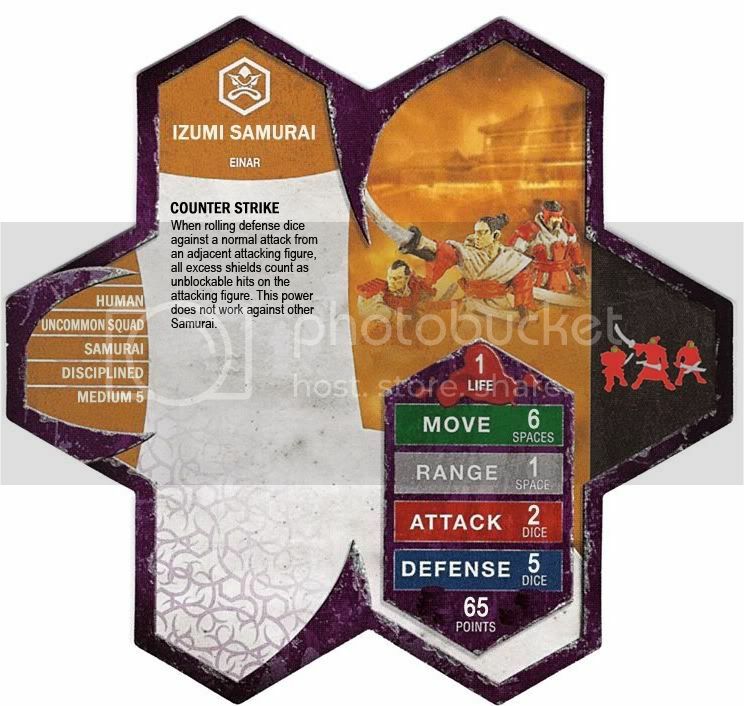 The wording specifically states to put the card from your hand to the battlefield without any sort of interaction to it. 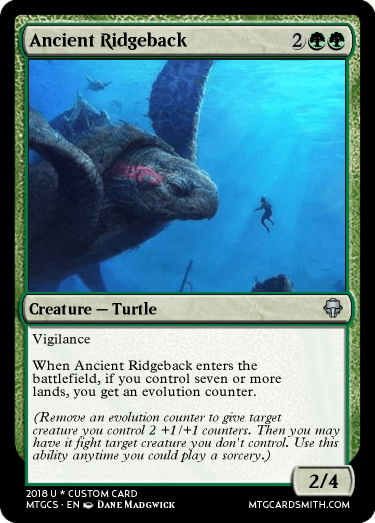 I feel that this keeps the flavor that this creature evolved into a bigger creature, rather than a new creature came in and replaced it. As a coincidence then, the evolution can't be countered except by countering the smaller creature's ability. Yes, that's a very positive element to your version. 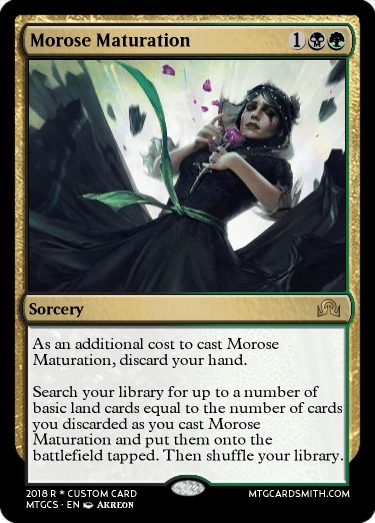 Also, from a flavor standpoint, it'd be better to exile than to sacrifice. I have some news everyone! Because of the great interest I and the community found with this topic (and a logistical lack of submissions), I have decided to extend it to next week. Here's another mechanic example again from Shadowverse exploring the evolve and overflow mechanics. Woop woop! Mark your calendars! 7/29/2018 is the new deadline! I'll be judging tonight though. Based on Spectre from the incredibly fun Smash Up! game! Based off of the whole game of Uno as a whole. Get your last licks! I'll be closing for judging soon. The results are in! I really appreciated the TCG diversity this contest has brought us. 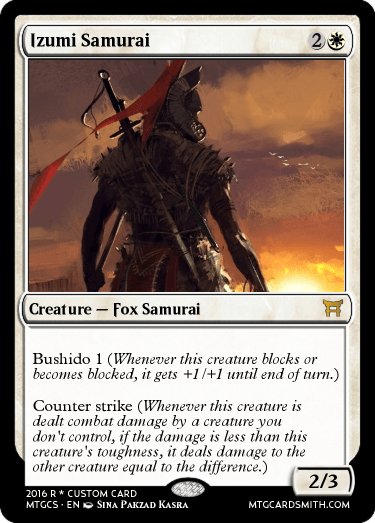 In third place, we have Faith'sGuide's deceptively simple Izumi Samurai. 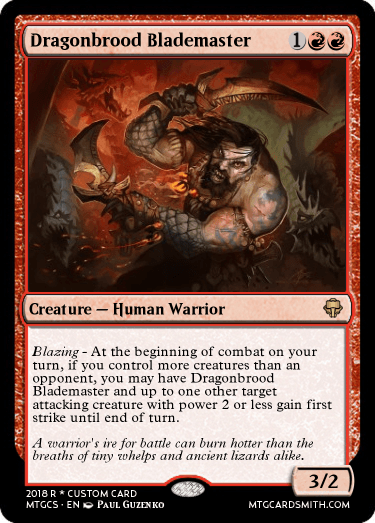 It's excellent with buffs and the type of Bushido card that's actually viable. Even though the interactions of Counter-strike can be difficult to get your head around, it brings much-needed possibilities to a bushido stat-line that should already exist. 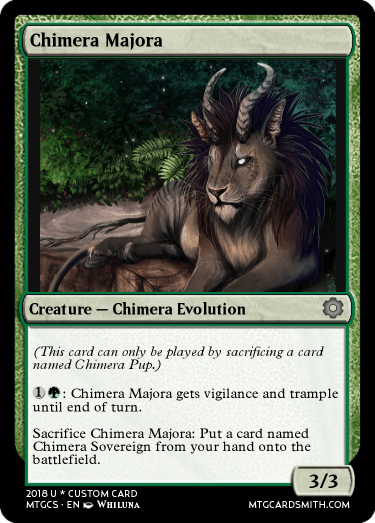 In second, we have Fiskerton's flavor-soaked Chimera Pup and evolutions. They grow up so fast. Even the key downside of the card has the flavor of Pokemon, that the evolution cards are kind of clunky without their basics. 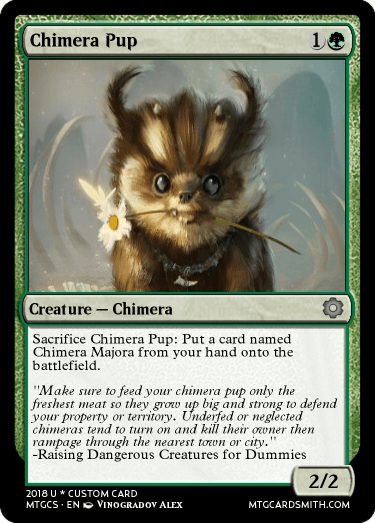 Using energy, creatures transitioning from cute to formidable: it just brings me back. In the O-so-spiffy first place, we have... one of the finest memes I have ever seen by none other than AustinSmith. Transcend into Nothing resonates with me on a spiritual level. A game as universal as Uno becomes an ambitious alt-win con in only the most jank of cheerios decks. It's just beautiful. Honorable mentions: AustinSmith's midrange finisher Nether Phantom and ManaChrome's zooish Dragonbrood Blademaster. Congrats other @Winners and @Mentionables! Thanks so much for the contest, @ShadeShinobi1! I'll PM you for my fave.